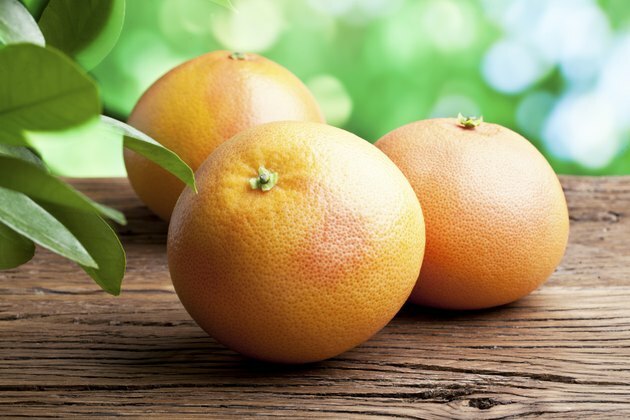 Grapefruit provides significant amounts of vitamins A and C and is relatively low in calories and low on the glycemic index, making it a nutritious fruit choice for diabetics. Eating grapefruit may also help you better control your blood sugar levels, but if you take certain medications, you may be better off choosing a different fruit because of potential medication interactions. Half of a large grapefruit has 53 calories and 13.4 grams of carbohydrates, including 1.8 grams of fiber. If you control your blood sugar by counting carbohydrates, this counts as one carbohydrate serving. Diabetics can typically have between 45 to 75 grams of carbohydrate per meal, or three to five carbohydrate servings. The glycemic index estimates the effect of a food that contains carbohydrates on your blood sugar levels. Foods with a low glycemic index of less than 55 aren't likely to cause large increases in blood sugar levels, while those with a high glycemic index of 76 or more may cause spikes in your blood sugar levels after you eat them. Grapefruit has a low GI of 25, so it isn't likely to have a significant effect on your blood sugar as long as you watch your portion size. Eating half a grapefruit before each meal may help you control your blood sugar levels and lose a small amount of weight, according to a study published in the "Journal of Medicinal Food" in March 2006. The fresh grapefruit helped improve insulin resistance as well as insulin levels two hours after eating. Grapefruit juice was also beneficial for weight loss, but not for improving insulin resistance. Stick with fresh grapefruit instead of grapefruit juice, which is higher in both calories and carbohydrates. Each 8-ounce glass has 94 calories and 22.1 grams of carbohydrates. Check with your doctor before increasing your grapefruit intake, because this fruit can interact with many medications, causing them to be either more or less effective, according to the U.S. Food and Drug Administration. It may also interact with the diabetes medication Metformin, making a side effect called lactic acidosis more likely, according to a study published in "Methods and Findings in Experimental and Clinical Pharmacology" in November 2009.